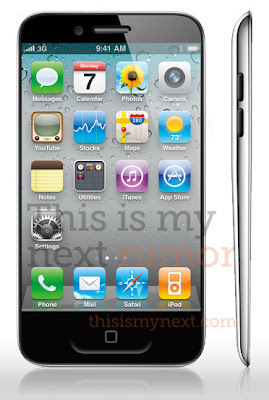 Virtual-Hideout.com: Is this what the iPhone 5 will look like? Here is the first hideous mock up of what some think the iPhone 5 might look like. This image was conceived over at Joshua Topolsky's new site and it's getting press all over the web (see: here too!). I personally hope to hell it looks nothing like this, especially in the thickness, or lack there of, department. I iPod Touch 4 is hard to hold while the iPhone 4 is about as good as it gets for an Apple products. I still have the iPhone 3GS and with a rubberized back cover on it I can hold it. Without one it's like a wet bar of soap. Here's an excerpt from Thisismynext: "In a sketch supplied to us by a source (on which the image above is based), the home button is doing double duty as a gesture area; this falls in line with testing we’ve seen for gestures on the iPad, and our sources say that gestures are definitely coming in a future version of iOS. The home button will likely be enlarged, but not scrapped altogether. Furthermore, we’re hearing that the screen on the device will occupy the entire (or near to it) front of the phone, meaning almost no bezel. Our source says the company is doing very “interesting things” with bonded glass technology, and has been exploring designs where the earpiece and sensors are somehow behind the screen itself, making for a device where the display is actually edge-to-edge. Regardless, the sketch we’ve seen suggests the screen will go up to 3.7-inches while keeping the current resolution, and at that size, pixel density goes from 326 to 312 (a drop of 13ppi)." I definitely think there is TOO thin and this would be it for me. What do you think?